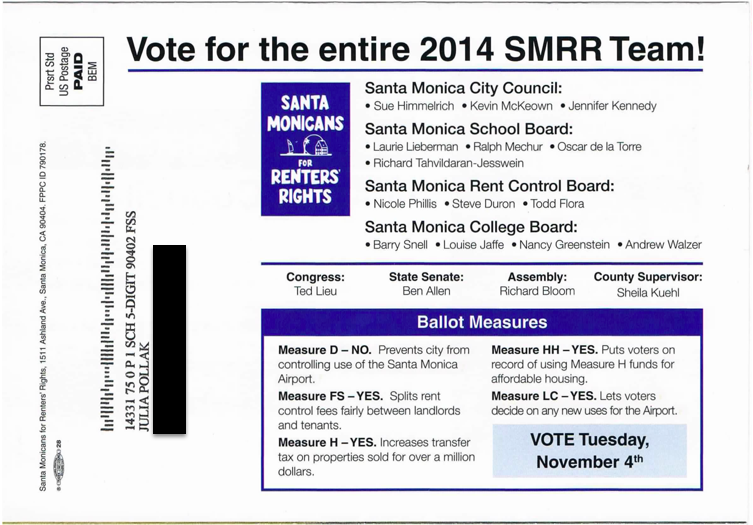 Supporters of Measure LC, a local ballot initiative that would allow the Santa Monica City Council to close the municipal airport when its operating agreement expires next year, have resorted to blatant lies in an effort to fool the public. Their goal is to defeat a rival initiative, Measure D, that would require any change to the Santa Monica Airport (SMO) to be approved by the voters in a referendum, effectively reducing the council’s power. Measure D has a simple appeal: let the voters decide the fate of a large public asset, whose destruction would be irreversible. It is such an effective message that those who want to close the airport, and support Measure LC, have simply stolen it. Measure D – NO. Prevents city from controlling use of the Santa Monica Airport. Measure LC: – YES. Lets voters decide on any new uses for the Airport. This description is so confusing that my wife–a Harvard graduate, Rand research fellow, and Navy reservist–told me she was convinced the renters’ group was supporting the airport after all. In fact, it is Measure D–not Measure LC–that allows voters to decide the fate of the airport. The only thing Measure LC allows the voters to decide is any subsequent development on the airport land. If the council closes the airport, voters pound sand. The city’s own attorney, in an impartial analysis of Measure LC, confirms: “Unlike that measure [Measure D], this one does not require a vote of the people to close the Airport or to restrict aviation fuel sales or the use of aviation facilities.” It is only “parameters for Airport development following closure” that “must receive voter approval”–unless the council decides to turn the airport into a park, in which case voters are again frozen out. The campaign for Measure LC itself uses similarly misleading tactics. Its own recent mailing (below) proclaims: “Local Control? It’s Your Choice!”–obscuring the fact that voters will not, in fact, have a choice over the fate of the airport. It is Measure D that actually provides for local control–with voters acting as a check on the city council. It is only by pretending to be Measure D that Measure LC has any chance of passing–i.e. by deceit. If Measure LC were as wonderful as its supporters pretend, they would tell the truth. Given the lies, however, it is natural to wonder whether the suggested “park” will turn out to be a development that enriches Measure LC’s supporters.